From now through September 3rd, American Airlines is offering a bonus when you buy or gift miles. Since these purchases are processed directly by the airline, if you use one of the Citibank AA credit cards or one of the Barclays AA cards they’ll count as airline purchases and you’ll earn additional miles for your purchase. You could also use the Amex Premier Rewards Gold card or Citi Prestige Card where you’d earn 3 Membership Rewards or Thank You Points per dollar spent and if you haven’t used your airline credit for the year, it should apply as well! Is it a good deal? Not particularly. 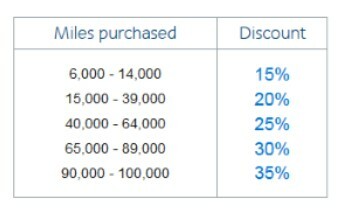 Unsurprisingly the best deal is if you buy the most miles. But if you haven’t used your airline credit for the year and have no plans to do so, why not buy the miles and get a $100 (Amex Gold) or $250 (Citi Prestige) discount? !